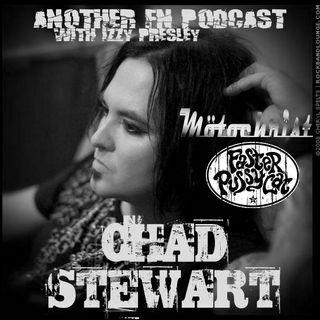 Chad Stewart swings by for a 2 1/2 hour conversation that covers pretty much anything and everything Faster Pussycat and his side band Mötochrist. We also talk KISS, Ace Frehley, Van Halen, Monsters Of Rock Cruise, answer listener questions, and all while drinking a 12er of Coors Light and drinking a bottle of Jack Daniels. We are putting the bottle of Jack on Ebay, which is signed by both of us, and the proceeds will go to the Ronnie James Dio Cancer Fund!